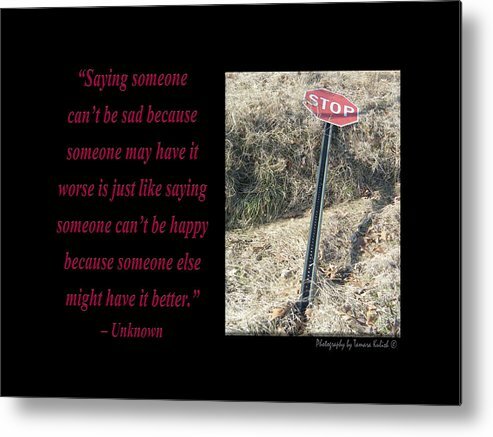 Saying Someone Cant Be Sad by Tamara Kulish - 8.000" x 6.000"
Saying Someone Cant Be Sad metal print by Tamara Kulish. Bring your artwork to life with the stylish lines and added depth of a metal print. Your image gets printed directly onto a sheet of 1/16" thick aluminum. The aluminum sheet is offset from the wall by a 3/4" thick wooden frame which is attached to the back. The high gloss of the aluminum sheet complements the rich colors of any image to produce stunning results. Thank you Celestial Images for featuring this piece on the group home page for "Vintage Images"! Thank you for featuring this picture John! 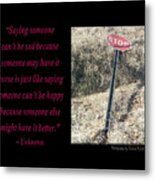 �Saying someone can�t be sad because someone may have it worse is just like saying someone can�t be happy because someone else might have it better.�� Unknown. How true! 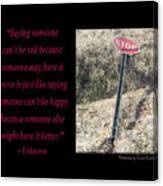 One of the quotes which is included in the book "On Becoming a Lemonade Maker" by Tamara Kulish. This smashed down stop sign in a ditch in rural Missouri spoke to me in it's distress! How true! 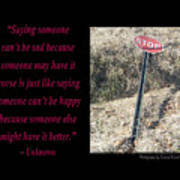 We need to just stop saying things which diminish people!